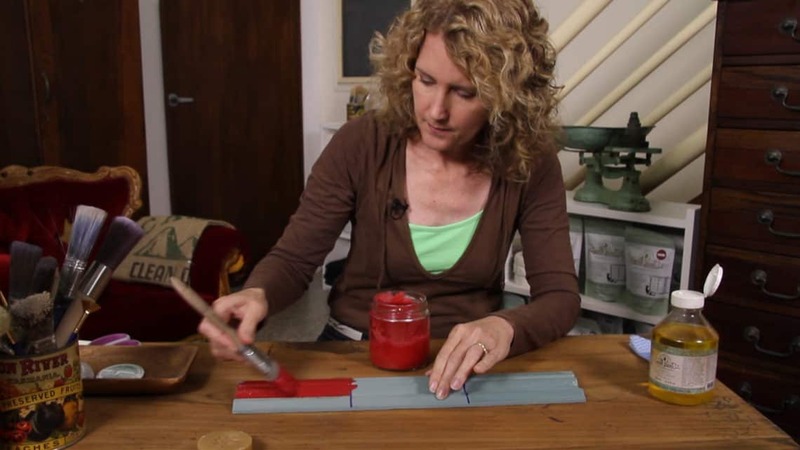 Milk Paint, Chalk Paint, Fusion Paint - What's the Difference? Free Download – What’s the Difference? Click Here for a FREE Downloadable PDF Reference Sheet outlining the Difference between Milk Paint, Chalk Paint & Fusion. 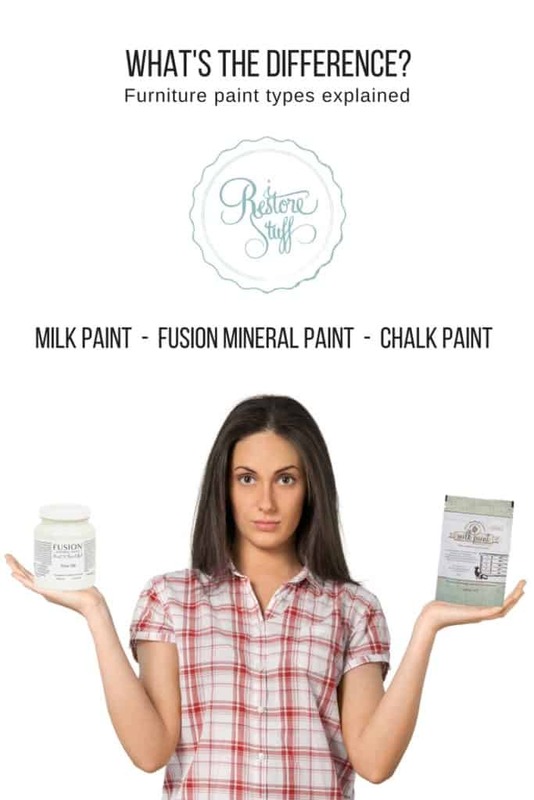 Download our quick reference guide comparison between Chalk Paint, Milk Paint & Mineral Paint? 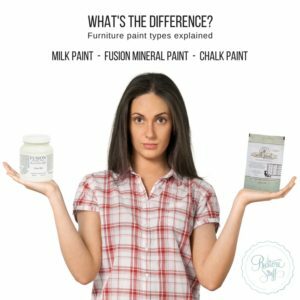 I’ve been asked so often to explain the difference between Chalk Paint and Fusion Mineral Paint, or between Chalk Paint and Milk Paint. So here’s a summary I’ve put together based on my opinion, along with my description of these products. Thrown in the mix, I’ll glean from the manufacturers of these products themselves for further info. Let me start by saying how much I love painting, and I really do love all these products, but I find that I use them for different pieces I’m working on, for different reasons, and I think that’s all just a matter of personal preference. 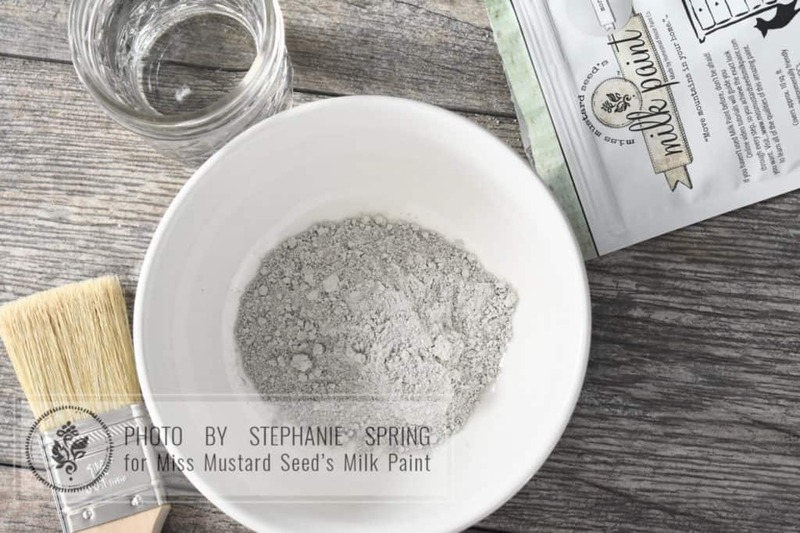 I first discovered Miss Mustard Seed’s Milk Paint via Marian Parsons’ blog, Miss Mustard Seed, and was excited when she partnered with Homestead House Milk Paint Company in Canada to produce a range of colours for this wonderful age old primitive style paint. I had my sister-in-law send me some from her closest stockist way before it became available in Australia (she lives in the USA). 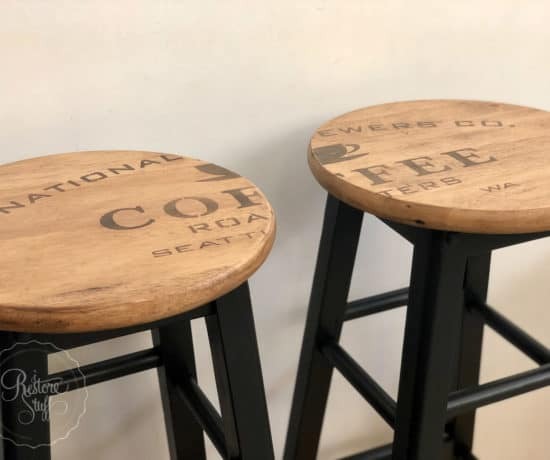 I fell in love with the quality and feel, and the authentic distressed chippy finishes that I could produce, topped with the lovely waxes or hemp oil to finish. 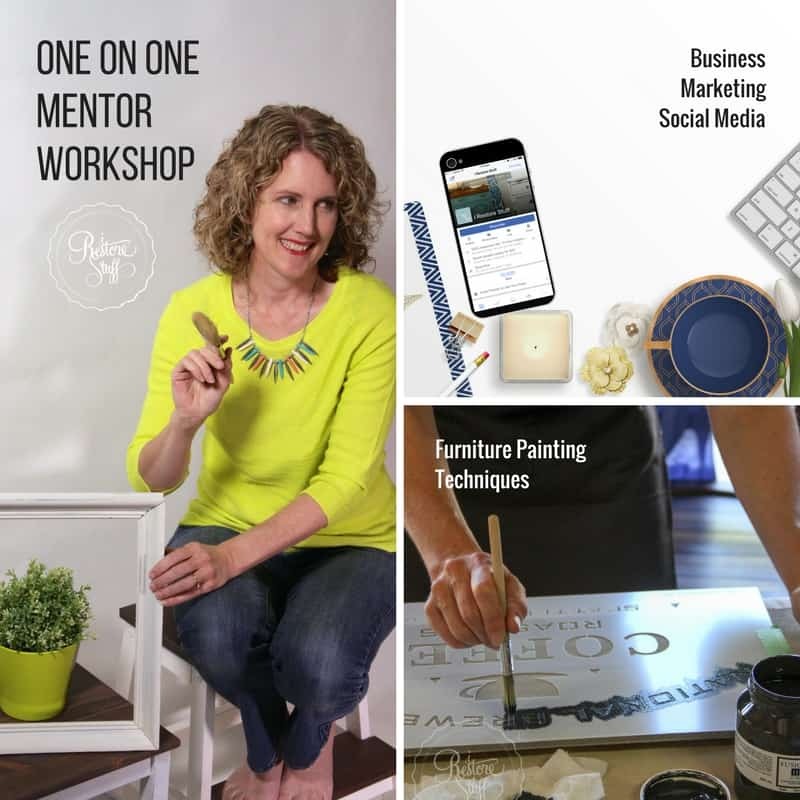 Full disclosure: It was easy to say yes to being a retailer in Australia for MMSMP, and I’ve made several video tutorials on my experiences with this type of furniture paint on my youtube channel. You can purchase MMSMP products via the Product tab on my menu bar. Milk Paint comes as a powder which is combined with equal parts water to form a smooth, slightly runny mixture, similar to pouring cream. Comes in 230gm & sample sachet (30gm) of powder. Some retailers may stock 460gm packets for serious furniture flippers. little need to prime or strip surfaces – very little prep required, unless you are wanting super good adhesion, in which case, sanding or even stripping may be required. self levelling, meaning you won’t see brush marks – the paint levels as you apply it to a surface. very quick drying – dries to a porous, chalky finish. can be used on many surfaces, but will often result in a naturally chippy or flakey finish on more varnished types of surfaces, unless a bonding agent is added. can be sanded back and distressed very easily for an authentic chippy or aged patina. only have to mix as much as required for each project. contains 5 simple ingredients: milk protein (casein), limestone, clay,chalk and natural & non-toxic synthetic pigments. 2-3 coats needed for good coverage. wash brushes out in water. Can use MMSMP Brush Soap for excellent results. 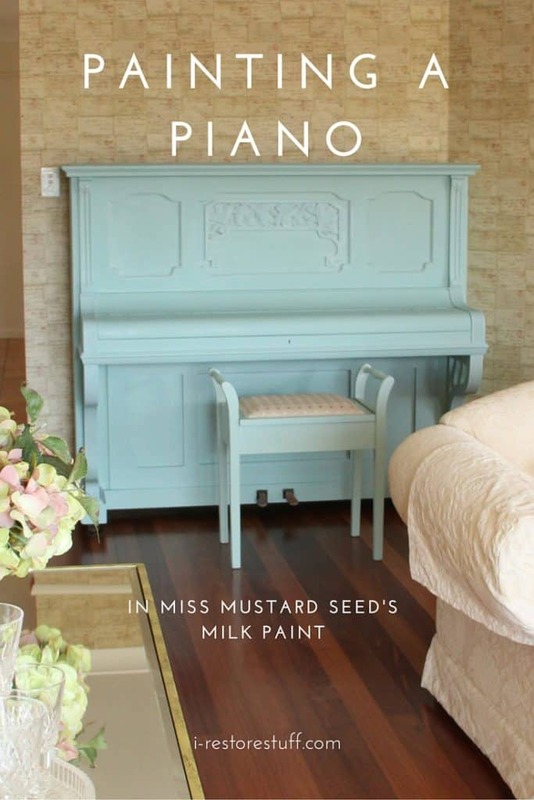 Click on this image to see how I painted a piano using MMS Milk Paint. 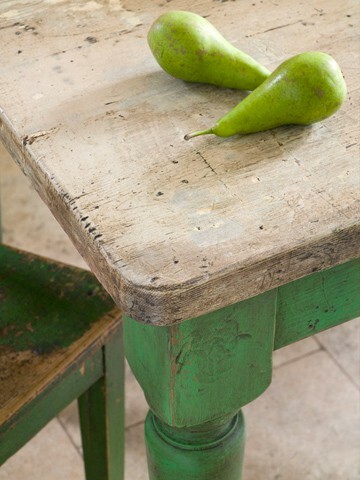 on antique pieces that lend to a lovely distressed chippy finish. 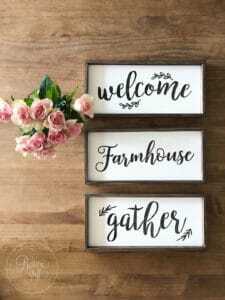 for an authentic French Country cottage or rustic feel, especially when using the white colours. 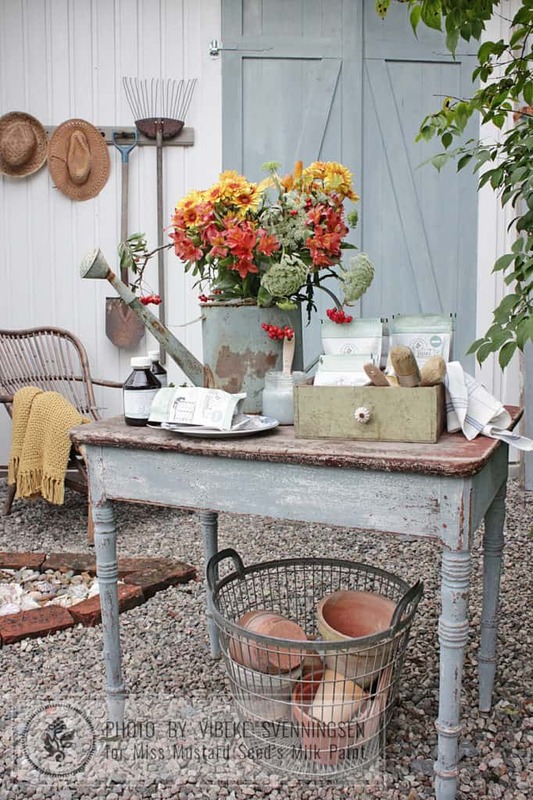 for a layered, farmhouse look using two colours. for a smooth modern look when adding the bonding agent. Family owned company, Homestead House, took over 10 years to develop, test and refine this amazing paint. You can read more in-depth features on their website here. I love using it, and all the extra products that compliment their range, like the Transfer Gel, Metallic Paints, Fresco, Glazes and more. I have also added the Fusion brand to my online store (Aussie customers) which you can find under the product tab on this website. ready made paint formula in a clear plastic jar, with a consistency similar to latex paints. comes in 500ml jars & 37ml sample pot. A 500ml jar covers all this. no need to prime or strip surfaces – very little prep required. *Note: prep is ALWAYS a good idea, no matter what paint you use, even if it’s just a quick scuff sanding. For an in depth article on prepping your piece, read HERE. self levelling – very minimal brush marks – the paint levels as you apply it to a surface. NO need for top coat – built in top coat means no waxing is necessary, but wax can still be applied if you prefer more of a sheen on your finished look. sticks to most surfaces, as the name (Fusion) suggests. water-based, non-toxic, lead free, virtually odourless and very low volatile organic compounds (VOC), contains no ammonia or formaldehyde. 50+ colours to choose from. 1-2 coats give good coverage. 500ml jar covers approx 7m². wash brushes out in water. for a beautiful smooth finish on more modern style pieces that I don’t intend to distress. on varnished or glossy surfaces where I think I’ll need a paint with a stronger grip. when I just need to whip out a quick project without the need for adding wax or a top coat to finish. to layer two colours on a surface (which you can really do with any paints) using a resist in between layers. 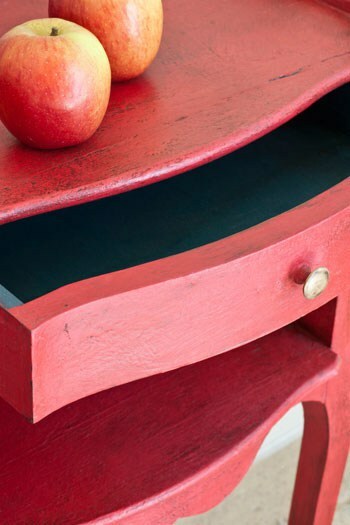 I also love the fact that it has a built in top coat, so no need to wax, but I can add wax if I wish to for extra sheen, antiquing wax for an aged dark finish, or white wax for a beachy look. Note: There are a growing number of Chalk type paints on the market both here in Australia and internationally. 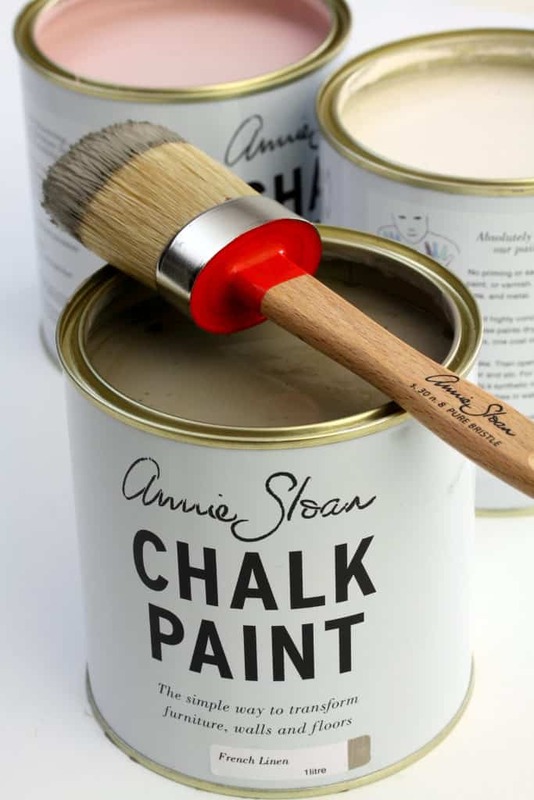 In this post, I am reviewing as per my experience with Annie Sloan’s Chalk Paint. 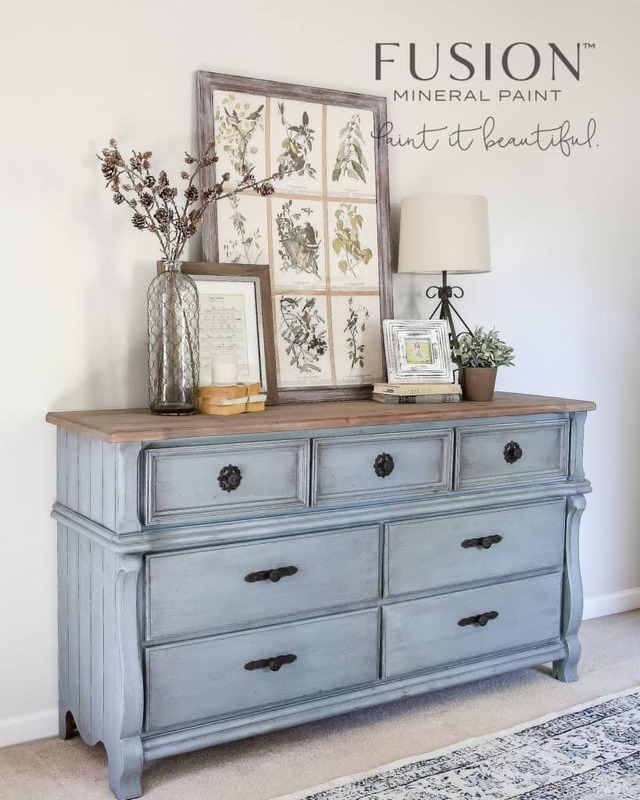 I have also enjoyed using Old World Paint, a chalk paint made here in Australia, and you can see my review on Old World Paint here on this bedroom set. Ready made paint comes in a can, and has a smooth, thick consistency. Comes in 946ml can & 118ml sample pot. 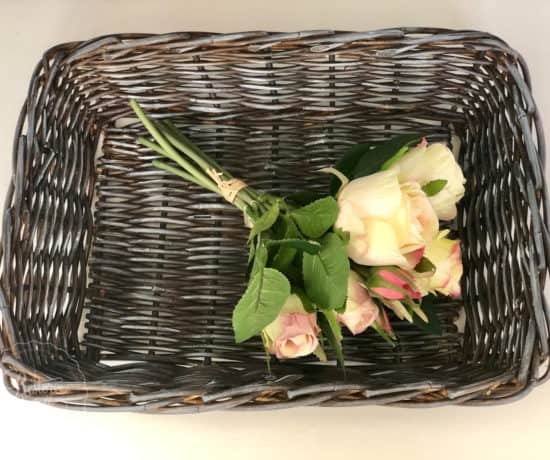 little need to prime or strip surfaces – *as I stated above, it’s ALWAYS a good idea to prep, depending on the substrate (surface you’ll be painting on), so for more reading on how to prep your piece, go HERE. sticks to just about any surface – wood, concrete, metal, matt plastic, earthenware and more, inside and outside the home. dries quickly to a chalky matte finish. brush strokes can create great texture, which works well with dark wax to age patina. Can also be sanded for a more smooth finish. 1 litre covers approx. 13m². 2 coats gives good coverage. Although I don’t use a chalk type paint as much now that I stock Fusion Mineral Paint, I still think it’s a good authentic option for painting aged finishes, and can achieve some great textured results. Well, I hope that has helped answer some of your questions about the differences between these types of paints. This is by no means a comprehensive list of pro’s and cons, and as I said, each is a matter of personal preference as to which paint you feel most comfortable using for different pieces. Download our quick reference guide comparison between Chalk Paint, Milk Paint & Mineral Paint. If you’re in Australia and trying to decide which type of paint you’d like to use, why not try either MMSMP or Fusion in a few sample size colours first. Order from our Product page. 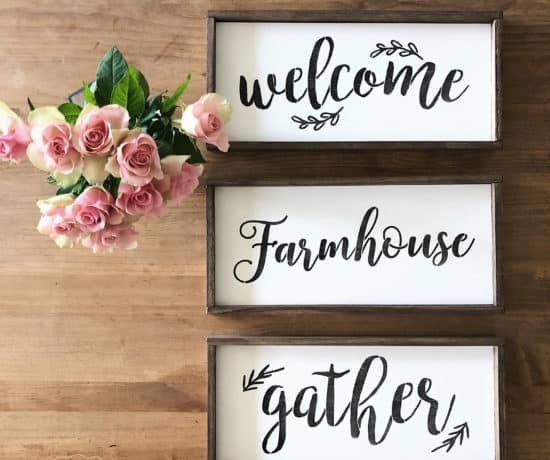 We’d love you to share your painted projects on our Facebook Group, so come and join the tribe and feel free to ask questions or share what you’re working on: I Restore Stuff – You Can Too. 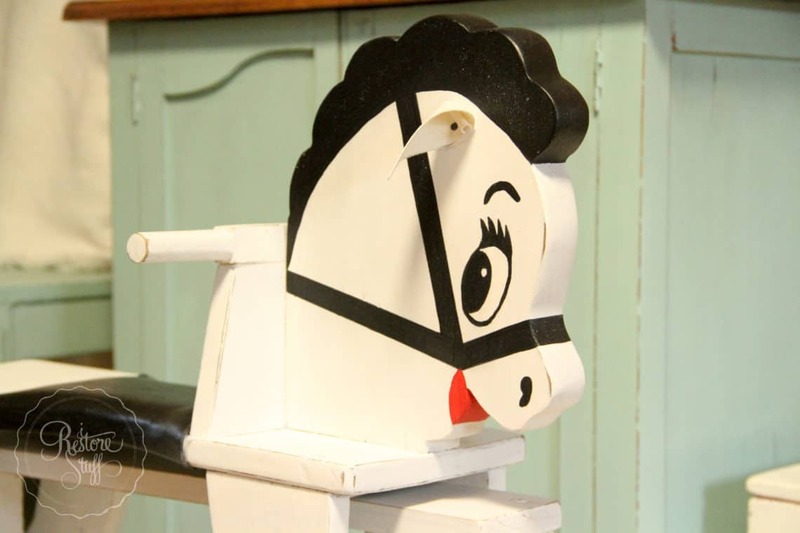 Rocking Horse Restoration – Calling in the Big Wigs! Excellent information. Thank you so much. Hi Emily, thanks for dropping in here. I am loving the Fusion. Yes, try both. It’s good to experiment with different mediums to see what you are most comfortable using. Excellent tutorial! Thanks for sharing. I love the mineral paint! Thanks Angela. Glad you found it helpful. I’m loving the Fusion Mineral Paint too. So many beautiful colours. Nice information on the new paints options. I still am wondering why standard latex paint has slipped off the scene? If you plan to distress, why use Fusion instead of the cheaper latex or spray paint? Thanks for the info. Can you tell me what type of oil to use over ASCP? I have a few little thing I am going to do and use up all my little left overs of ASCP. Don’t really want to buy a new wax as I’m going to start using Fusion on future projects. 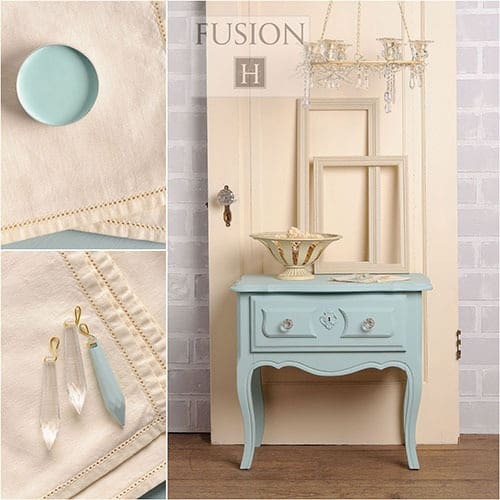 You can use any of the Fusion finishes or Milk Paint finishes over ASCP as they are all water based products. Fusion has a finishing wax that has a combination of bees wax & hemp oil in it (all natural) and MMSMP has some beautiful soft waxes as well as Hemp Oil that are beautiful natural finishes. The hemp oil tends to soak in and settle into the paint, drying to a matte finish after a day or so. The waxes all buff to a lovely sheen. I am going to paint my kitchen cabinets and wonder which paint you would recommend. My cabinets are oak with shiny finish. Let me know how you go. Would love to see pictures and share them on the blog! Hi, I just bought my first bottle of fusion paint. I painted over a side table for living room I did 2 coats , I’d like to antique it a little and bought the antique sealer but not sure how to go about it. Any help would be greatly appreciated. I would apply the Antiquing Sealer in the same way over your painted project. 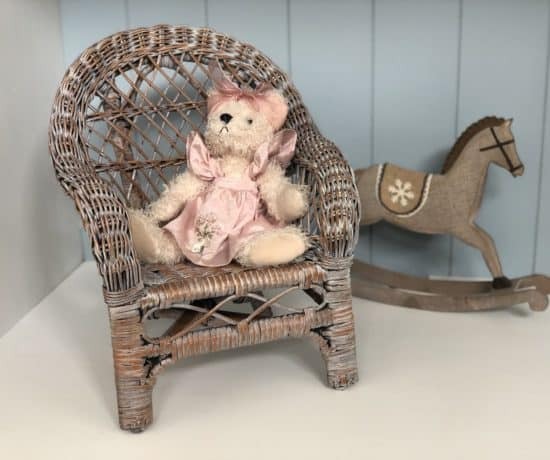 The way the antiquing sealer becomes most effective is if there are tiny grooves in the wood grain or in the paint brush strokes for the antiquing colour to sit in these places, creating a slight antiqued colouring to the area. I personally prefer to use the Antiquing Glaze for creating the antiqued effect, as it seems to have a longer open time (ie. time it takes to dry is longer, giving you more time to “play” with the look of it). I hope this info helps. Hi, I am considering painting my early 1990’s flat formica cabinets with the oak bottom strip. Have you ever tried the fusion on a formica surface? Would you have any recommendations for best type of paint to use? Thank you! Hello, I am brand new with the Fusion Mineral Paint. We don’t have a Dealer near our city, so I ordered online. 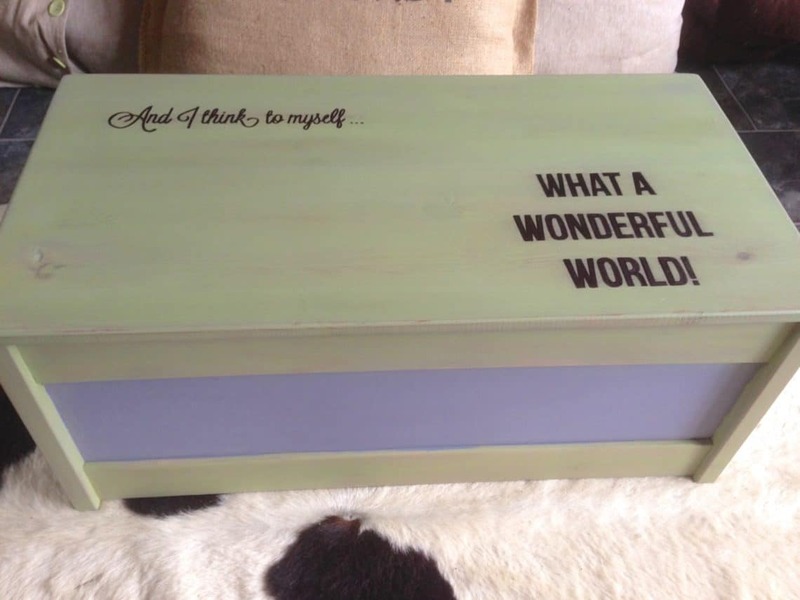 I ordered the Beeswax, thinking that all the pieces would need to be waxed like the Annie Sloan Chalk Paint. I painted the shelf in Ash and a few hours after it dried, I applied the Beeswax. How long do I need to let the was sit on the piece before I wipe it off? Thank you! Hi Angela, Fusion Mineral Paint has a built in topcoat, so appying wax is only an optional extra if you’d like more of a sheen than the lovely matte finish that Fusion paint has. Usually it’s best to wait 2-4 hours before applying anything else like wax to the painted surface. Once you have applied the wax with a brush or lint free cloth, as the instructions on the Beeswax Finish suggest, you polish after 30 mins. I usually don’t wait the full 30 minutes as this is a guide. Polishing means using a clean lint free cloth and swiping your cloth back and forth in a buffing motion across the waxed surface using a firm pressure to buff to a nice sheen. There should be no sticky feeling after you have polished, but a smooth sleek surface. Hi Michelle, I have some tutorials over on my youtube channel here if you want to check them out https://www.youtube.com/irestorestuff. Also look up Fusion Mineral Paint’s tutorials via Homestead House on youtube for great tutorials here: https://www.youtube.com/channel/UCr4_SaRkRUSk6PY7RNqmVwg. Hi I am wondering if Milk paint is good on floors. I have a house that is aprox 100 years old and still has the original hard wood floors in the kitchen. I have been thinking of milk painting them to a whiter finish. but am not sure if i would have to seal them or not to keep the floor looking good. Hi Lisa, yes people have used the Milk Paint on wood floors quite successfully, but I would definitely seal it with something that is durable and specific for hard wearing use on floors. 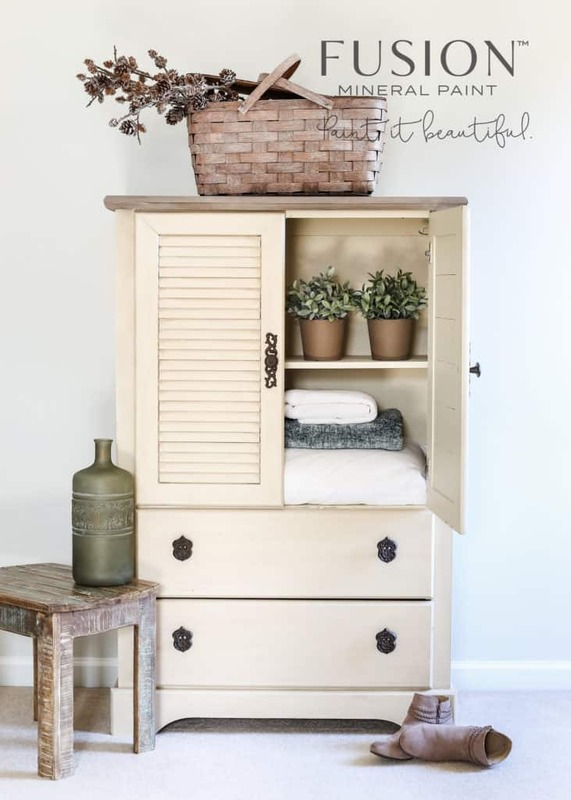 Especially if you are using the milk paint for a white wash finish. You want it to be easily washable.